Screen time is very addictive and interferes with personal relationships. 1) For young children, be careful about using the T.V. as a babysitter. 2) Avoid allowing children to have computers in their rooms. 3) Make agreements with children about how much TV, video games, texting and internet time is reasonable. 4) Brainstorm fun alternative activities, that bring family members together. Did you hear that??? That was me having a PANIC ATTACK after reading this tool card!!! It's not that I disagree with the concept of this tool card. On the contrary, I wholeheartedly agree that limiting screen time for my children would be better for their mental and physical health. But it's MY mental and physical health that I'm concerned about! Let me explain the current situation in our house. When my children are not doing their homework or practicing their instruments, they are in front of a screen. Either a T.V. screen, a computer screen, a Wii video game screen or an iPod touch screen. Even when we leave the house, they get in the car and watch a DVD on the drop-down screen. I'm not proud of this fact. But you have to understand that when my kids aren't staring at a screen, they are staring at each other...and arguing, bugging each other, and yelling "DAAAAAAAD!!!" Then I have to come referee the current squabble. So in the interest of peace and quiet, I not only allow my kids to have their screen time...I encourage it. To add to the difficulty of the situation, my job requires that I spend a fair amount of time in front of my computer screen. So it's hard for me to set a good example for my children. Can you see why I had a panic attack when I read this tool card? 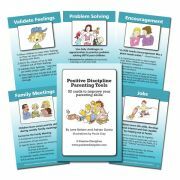 But since I believe in the concept of limiting screen time and since I am committed to improving my parenting skills each week, I am going to make every effort to implement the concepts of this tool card. But I am going to need help. If anyone has ideas about how to make this a little less traumatic, please post your comments. When we had our family meeting about limiting screen time. My kids decided that during the school week one hour of T.V. each day should be enough. We also agreed that there will be no T.V. until homework is done and music practice is complete. It was also agreed that 1/2 hour of recreational computer time would be enough each day. If the kids need the computer for homework, that doesn't count. And 1/2 hour of video game time. My biggest concern is how I will monitor the children's screen time. To start out I will have to just use the honor system because I don't have time to run around with a stop watch. I'm sure that the kids will help by tattling on each other if someone watches too much T.V. Especially if that child is waiting for their turn on the T.V. And I may just have to take away the hand held devices if they become a problem. Your pictures made me laugh. My kids are younger, but we still use too much TV and it's always bothered me. But I, too, use my computer for work (and for Facebook and reading blogs! )and my kids also are peaceful and quiet when watching TV...so tempting to turn it on when things are going downhill! Still, I have been setting each week's card on my keyboard number pad, right where I see it all the time, so we'll see if I can't work harder to come up with alternatives this week! Thanks! I agree, that would be helpful. There are several of those cards in the deck. Luckily we are on this year long journey. So we can build on each tool. Even though we are done with "Routines", "Listen" and "Encouragement"...I am still working on those every week. By the end of the year we will have a full toolbox of skills and resources. This may sound crazy, but we don't have a TV. We do have laptops that are primarily for work. My 4 year old son watches 1/2 hour of a dvd in our collection in the morning. I think the hard thing in making the change is finding what to do when you are not on the screen. Here are some ideas: music time (the family sings and gets out the electric guitar and other instruments, game night (board games), having friends over, getting outdoors, woodworking (he has his own workbench in the basement), projects like painting, drawing, stamps (he has his own cabinet and a place in the basement for messy stuff), etc. 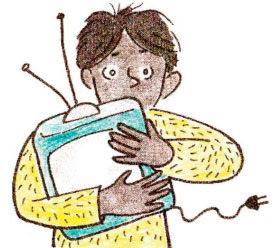 There's actually a sort-of official "TV Turn-off Week" in April - that's pretty far away yet but being part of something bigger might be a way to sell it to your kids! Thought I'd share this timely post from another blog http://tinytreksunplugged.blogspot.com/2010/01/tips-for-getting-screen-time-under.html of a local group close to Seattle that organizes outdoor adventures for kids weekly.